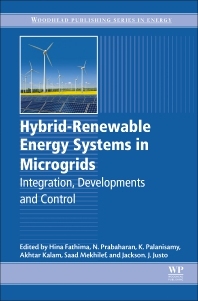 Hybrid-Renewable Energy Systems in Microgrids: Integration, Developments and Control presents the most up-to-date research and developments on hybrid-renewable energy systems (HRES) in a single, comprehensive resource. With an enriched collection of topics pertaining to the control and management of hybrid renewable systems, this book presents recent innovations that are molding the future of power systems and their developing infrastructure. Topics of note include distinct integration solutions and control techniques being implemented into HRES that are illustrated through the analysis of various global case studies. With a focus on devices and methods to integrate different renewables, this book provides those researching and working in renewable energy solutions and power electronics with a firm understanding of the technologies available, converter and multi-level inverter considerations, and control and operation strategies. Hina Fathima received the B.Eng. degree in electrical engineering from Anna University, Chennai, India in 2006. She completed her M.E degree in 2011 and followed up with a Ph.D degree in Electrical Engineering from VIT University, Vellore, India in March, 2017. She also holds a post graduate diploma in HR management. She has academic and industry experience of more than 7 years. Her research interests include power system optimization, hybrid renewable energy systems, integration of energy storage with renewable power grids, energy management of distributed generators and smart grids. She has authored publications and book chapters. In 2015, she received the International travel grant from SERB under Young Scientist category. She is also a reviewer for many reputed Elsevier and IET journals. She is a student member of IEEE and is currently employed as a lead engineer with HCL Technologies Pvt. Ltd in Chennai, India. Lead Engineer, HCL Technologies Ltd., Chennai, Tamil Nadu, India. N. Prabaharan (M'13) received the B.E. degree in Electrical and Electronics Engineering from Anna University, Chennai, India in 2012. He received his M.E. degree in Power Electronics and Drives from Anna University, Chennai, India in 2014. He obtained University Merit Ranker Award in 2014. He received his Ph.D. degree in energy and power electronics from VIT University, Vellore, India in 2017. He received the two prestigious travel grant under the category of Young Scientist from the Science and Engineering Research Board (SERB) and Asian Development Bank in 2015 and 2016 respectively. He is currently a senior assistant professor in the department of electrical and electronics engineering at Madanapalle Institute of Technology and Science, India. He is also a reviewer for various reputed journals (IEEE, IET and Elsevier) and technical program committee member for many reputed International conferences. His research interest includes power electronics, new topologies for inverter and converters, grid integration of renewable energy sources and its controllers, microgrid. Senior Assistant Professor, Department of Electrical and Electronics Engineering, Madanapalle Institute of Technology & Science Angallu, Madanapalle - 517325 Chittoor District, Andhra Pradesh, India. Palanisamy received the B.E. degree from Madras University, and the M.E degree in electrical engineering from Anna University. He completed the Ph.D. degree in 2013 from VIT University, and has been teaching in the area of power systems for over 15 years in the School of Electrical Engineering, VIT University. He has also been pursuing research in the field of FACTS devices, renewable systems and smart grids. He is currently the Head of Department of Energy and Power Electronics, School of Electrical Engineering, VIT University, and is also serving as editor and reviewers in various journals. He has more than 40 publications on renewable energy, smart grids, optimization, FACTS and MLI’s. His major interests are Smart grids, renewable energy, MLI’s, FACTS and custom power devices. Akhtar Kalam received the B.Sc. degree from Calcutta University in 1969 and the B.Sc. degree in engineering from Aligarh Muslim University in 1973. He received the M.S. degree from the University of Oklahoma and the Ph.D. degree from the University of Bath for his work on the application of distance protection to series-compensated extra high-voltage line. He has been actively engaged in the teaching of power systems for over 20 years, both in the School of Electrical Engineering, Victoria University of Technology, and overseas. He has conducted research, provided consultancy, and has more than 280 publications on power system protection and independent power generation. His major interests are power system analysis, power system protection, and expert system application in power system, cogeneration, and renewable energy. Saad Mekhilef received the B.Eng. degree in Electrical Engineering from the University of Setif in 1995, and the M.Eng.Sc. and Ph.D. Degrees in Electrical Engineering from the University of Malaya in 1998 and 2003, respectively. He is currently a Professor in the Department of Electrical Engineering at the University of Malaya and has been actively involved in industrial consultancy for major corporations in the power electronics projects. He is the author and co-author of more than 100 publications in international journals and proceedings. His research interest includes power conversion techniques, control of power converters, renewable energy, and energy efﬁciency. Jackson John Justo received the B.S. degree in electrical engineering from University of Dar es Salaam and the Ph.D. degree in electronics and electrical engineering from Dongguk University. He is currently working as a Lecturer in the Department of Electrical Engineering, University of Dar es Salaam and since April 2016, he has been a Research Fellow with the Department of Electrical, Electronic and Computer Engineering at the University of Pretoria, South Africa. His current research interests include energy efficiency and management for smart city and transportation, power converter control for electric vehicles and drives, smart grid with renewable energy, energy storage systems, and simulation using real-time digital simulators and OPAL-RT units.